Building on the huge success of their Irish launch last year, GrowRings are expanding their distribution to accommodate for international demand. GrowRings will be exhibiting at a number high profile international shows in the coming months, commencing with the Ideal Homes Exhibition at the RDS in April. Other international trade shows of a similar calibre in England, Germany and USA will provide a gateway for the company to establish key partnerships with businesses across the globe, as well as directly with consumers. Show visitors will get the opportunity to talk to GrowRings experts about the care and maintenance of a garden and how easy it can be with the help of their innovative product. The concept of GrowRings is designed around modern day living, doing away with high maintenance flower displays, or fruit and vegetable patches to make way for convenience. GrowRings is a very simple concept; the modular, circular design allows the user to have a fit-for-purpose raised garden bed in a matter of minutes. 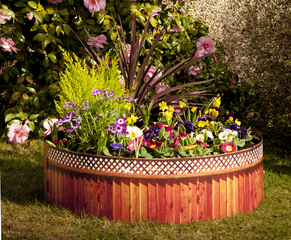 There are no tools necessary – two or more panels (depending on the diameter required) snap together to form a natural circular raised bed 10 inches in height. GrowRings are for everyone, be it the gardening enthusiast or the gardening novice with absolutely no experience. Growing vegetables, fruit, plants or herbs becomes a simple straight forward process that can be done in the smallest of spaces. Their easy-to-use and assembly method makes it the ideal way to use creativity in any sized outdoor space, from a small apartment balcony to larger gardens. The product was a huge hit with the panel of entrepreneurs when they appeared on RTE’s “Dragon’s Den”. The ‘Grow It Yourself’ sector is becoming increasingly popular as more people seek to improve their health with home grown produce, save money on shopping bills, as well as moving towards reducing their carbon footprint. Growing your own fruit, vegetables and herbs has never been easier.